Ai Weiwei in an interview on CNN. 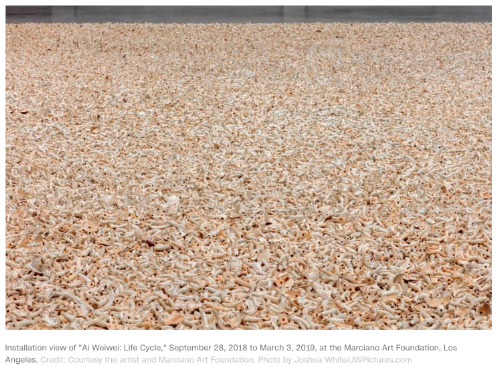 Ai WeiWei, Chinese dissident and one of the most interesting artists in the world, has mounted "Life Cycle" an exhibition, simply put, about refugees, at the Marciano Art Foundation in L.A. It is on view until March 3, 2019. Admission is free, but it is a ticketed event. To reserve tickets: www.marcianoartfoundation.org. Click here to see an interview with the artist and read more about the exhibition in an article from CNN. 300,000 teapot spouts form part of the exhibition, representing the mouths of those who cannot speak and be heard.